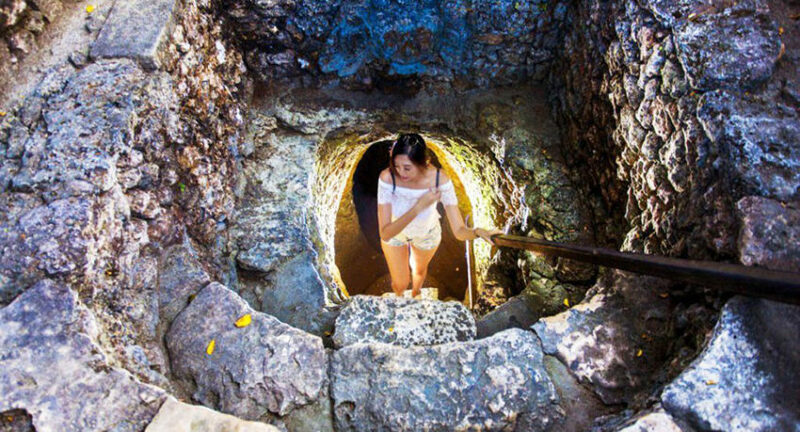 Ever thought of staying in 7 meters underground for your Bali sightseeing tour? Well, it won’t be just your imagination now because Nusa Lembongan has its secret underground house, Gala-Gala Cave! This underground house will turn your tour to extraordinary. Located in Jungut Batu village, this house was built in 1967 by Mangku Byasa. It is said that this cave was inspired by Panca Pandawa story. It took 15 years to finish the underground and was used as hiding place for Pandawa family. In the story, it is told that the Pandawa family must escape to the middle of the forest, then this cave or underground house was made as a hiding place. Now, this underground house is becoming one of most wanted Bali sightseeing places in Nusa Lembongan! The construction process of this cave was quite unique and traditional because Mangku Byasa still used traditional equipment such as crowbars and was added by the mixture of burned cow dung which turned out to be quite effective in softening limestone to become easier to dig. But who knows the traditional way he used turns to be the one of the best sightseeing in Bali, especially in Nusa Lembongan? From the outside, the uniqueness of this cave does not appear because of its location which is indeed in the underground. But when entering to the cave complex, you will see several typical Balinese houses with various displays of Balinese fabrics, which will make you feel the truly sightseeing Bali attractions. Cool yet creepy is how you can describe this place. Even though lightings have been set up, the underground house is still dark, bringing the creepy vibe. The unique thing from this place is although it’s placed under ground, the air circulation is still good. This means that the air circulation in this house has been planned, so you won’t feel hot or breathless. The Gala-Gala Cave is actually built for meditation room. When come in to the house, you will feel that this house was made of simple equipment. You will find a room to meditate complete with kitchen, bedroom, living room, dining room and a number of other places. On its wall, there are carvings in the form of elephants and there are areas named Yamuna River and Ganges River. These carvings really reflects the Indian culture. Gala-Gala Cave was designed to have 3 entrances, while the deepest ground overdraft is 7 meters deep. The entrance is approximately 2 meters deep by going down the stairs and several aisles are shorter than the size of an adult’s body. So this place will be a challenge for tall people! If you visit this Bali sightseeing spots, it’s also recommended for you to be assisted by your Bali tour guide or the cave guard. Why? Because you might be lost in the house! Even though the cave itself is not too big, but there are many halls and other small caves inside. These might confuse you. The Gala-Gala Cave is located about 50 meters from the highway on the island of Nusa Lembongan, so after parking the motorbike or car, then you have to walk a little to the cave. Meanwhile, to reach Nusa Lembongan, you need to take fast boat from Sanur Beach and it takes about 30 minutes to the island. If you have arrived at the Jungut Batu Pier, you can use your Bali tour vehicle or rent a motorcycle to go to the Gala-Gala Cave. omg a meditation room in a cave?! it looks stunning! i would love to visit one day! This looks great! I have only been to Java and Lombok but next time I visit Indonesia I am planning to do Bali for a day or two ( can't stand the tourism so I can only do a few days) and I will deffo visit these ones! omg you had me at meditation but in a cave is so much cooler experience- i def want to try this out one day if i can! Sounds like a thrilling adventure! I've always wanted to go back to Bali, keeping this place in mind the next time we visit. Wow this place looks ancient and beautiful, i love visiting these kind of places. Holii! I think it's a good place to meditate, because you should be very calm, and I think it would also be very good temperature. Good day!! It looks like such a cool location. I've always wanted to visit Bali, hopefully I can soon! Thank you for sharing and recommending the places. Sound pretty cool. OMG. i'll def go to this spot the next time i visit! Yeah right ... You have to come here ... And see by yourself the uniqueness of this place.. I would love to meditate in a cave! This has to be the coolest place on earth! Let's Come here, Bree.. It's really wonderful place..
WOW. This looks like a wonderful experience. I would love to visit Bali soon. That's such an amazing place. I have Bali on my vacation places list. I'd love to visit this place. WOW this looks amazing!! I would love to go down there and just get the feel of the creepy, yet historical room! That's really neat! I have always enjoyed exploring caves and this one sounds perfect. This is my first time hearing about Gala-Gala Cave, but it's now on my list of places to visit someday. Wow, what a fascinating place to visit! I don't know if I could stay there for too long - claustrophobia or some other phobia might drive me back above ground! But still, it looks like it would be fun to visit. You have to go to this place ... It's so beautiful and amazing ... This underground house has doors, as well as the holes, are capable of being ventilation and air circulation so that the addresses in the cave, you will still feel cool.. This sounds a really magnificent creation and I am impressed. Love to visit that place someday. Thank you for comment, Angela Ricardo 🙏.. Yes, I agree with your opinion ... This underground house is indeed an amazing creation and is one of the unique place to explore if you visit Bali Island in the future! Wow..this sounds amazing. I would like to go there and experience the cave. Thanks for sharing. I never have been in a cave before. But, this looks cool and even cooler is the meditation room! Thanks for sharing about this place. I would love to visit it. You are welcome, Kalyan Panja.. We are waiting for you visit and join with us soon..